RED WING, MN (October 2010) — Irish Setter boots, a division of Red Wing Shoe Company, is donating over $10,000 to The Breast Cancer Research Foundation® for the second year in a row. The donation is part of a year-round program developed by Irish Setter in 2008. Irish Setter donates a percent of each Ladyhawk women’s hunting boot purchase to TBCRF. The Irish Setter Ladyhawk series includes the Ladyhawk #3886 7” hunting boot featuring 600 grams of Thinsulate Ultra insulation and brown on brown leather/nylon uppers. The Ladyhawk #3887 contains 1000 grams of Thinsulate Ultra insulation in a 7” Mossy Oak Break Up Camo/Brown leather package. The Ladyhawk #2887 is a 15” knee boot featuring 1000 grams of Thinsulate Ultra insulation, Realtree All-Purpose camo, ScentBan, easy on/off side zipper and Ultra Dry waterproof construction.The camo versions include a camo-wrapped EVA midsole. The boots are available in women’s sizes Medium 5-11. 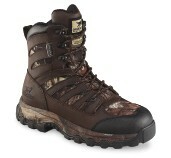 Starting at $109, the Ladyhawk styles are available now at local retailers and online retailers like Cabelas.com and BassPro.com Visitwww.irishsetterboots.com for the retailer nearest you. “Irish Setter’s Ladyhawk line has been a great success. We added this new knee boot to give women more options,” explained Irish Setter Marketing Manager Mark Dinndorf.